Once again, I am on a mission to get fit and healthy and today is the start of that. I shall be joining a gym this afternoon (my fourth attempt! ); having a car now means it’s a bit easier to fit in a workout than it was when I had to get a bus or even two to get to the gym! 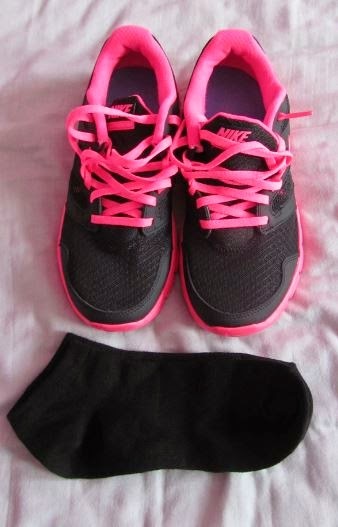 So in order to get myself motivated, I purchased some new trainers and will try to workout as much as I can. However, I know that I’m not going to be able to get to the gym every single day so I’ve set myself a target of going three times a week; then anything over this is a bonus! 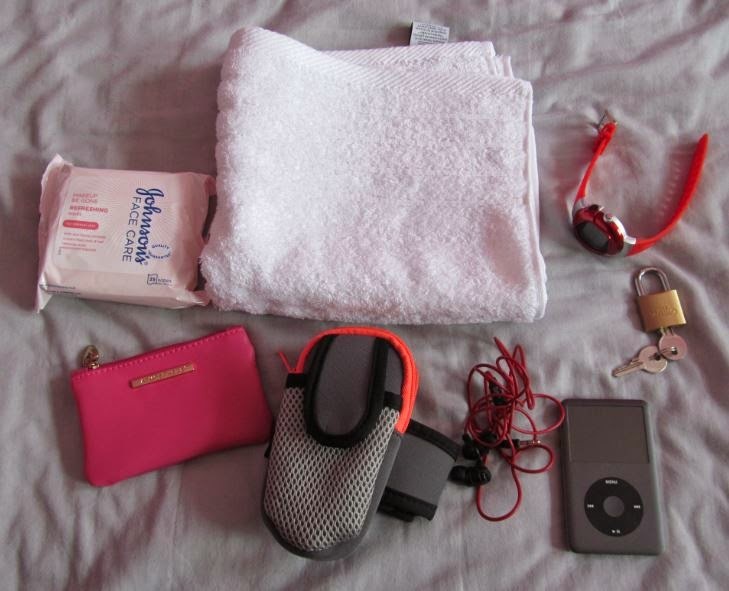 Moving onto the actual blog post, I thought I’d give you all a peak at what’s inside my gym bag. This is a typical example of what I wear to the gym. I always always always wear a sports bra. Usually they’re a bright colour like this one. Next up is my Beatles vest. I tend to keep old vests and tops for the gym. And lastly are my black yoga leggings. I have a rule for the gym when it comes to clothing. If I’m wearing shorts, I’ll cover my shoulders. If I’m wearing longer bottoms, I’ll wear a vest. I don’t like to show too much skin. Next up are my amazing new trainers. They’re from the kids range because I’m only a size 4! When I bought them, the shop assistant suggested trying gel insoles to protect my feet which I was all in favour of! I always wear trainer socks with gym shoes too; these are only from Primark as I really do not see the point in buying expensive socks! Here are my gym essentials (and all the things that don’t fit in my toiletry bag!). Face wipes are so important to use before and after a workout. I never workout wearing make-up but it’s vital to get rid of all the toxins produced during exercise that have built up on your face. Also a towel can come in handy for wiping down equipment as well as yourself. I also use them to cover the screens on cardio machines so I’m not constantly clock watching! I also have a sports watch which tracks my calories burned as well as working as a heart rate monitor. I only take a small purse with some loose change in to the gym. Unless I know I’m going somewhere straight after, there’s no point in carrying something bulky with all my discount cards in. It’s only in case I forget my water bottle or something! Next up is this armband case for my iPod and headphones. Having an iPod classic has its advantages but they are fairly bulky. I saw this in Primark to hold it in during my workouts and thought it was perfect. Then it will be out of the way and I can focus on my workout without faffing about with my headphones! Music is so important for me during my workouts. Finally, for my gym, they require members to bring their own lock; this is just a cheap one from Wilko’s. 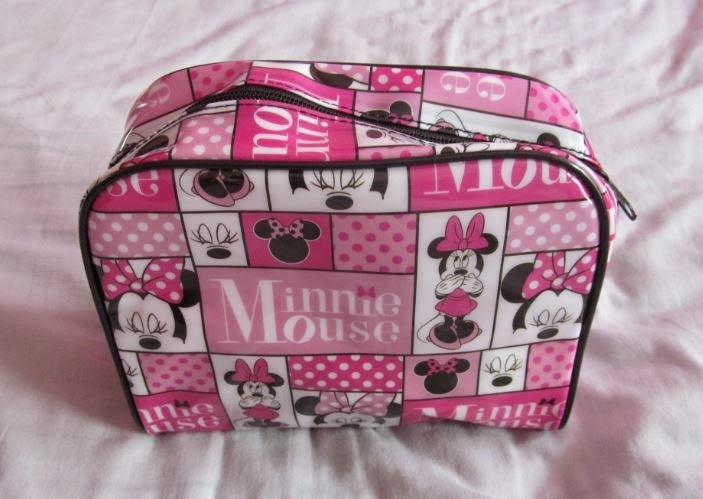 Finally is my super girly Minnie Mouse toiletry bag. This has all my essentials in that I could possibly need. I tend not to shower at the gym because I can just shower when I get home but I always make sure I have deodorant and perfume with me. I also take antibacterial hand-wash (you know the stuff that doesn’t need water) because I’m a hygiene freak! 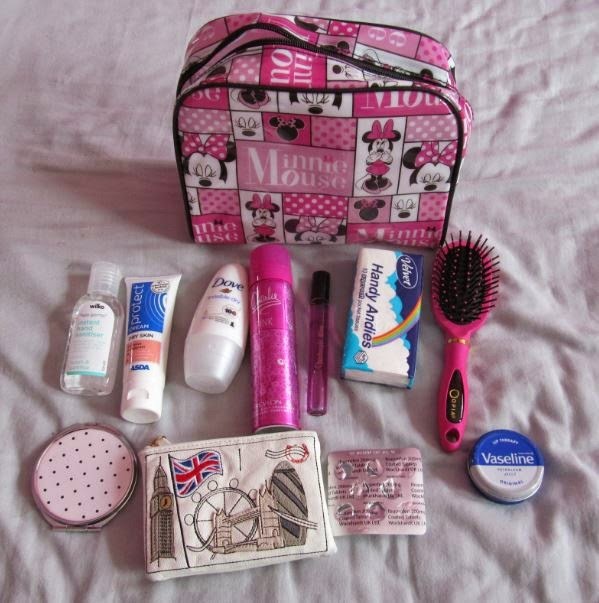 Other essentials are tissues, a mini hairbrush, a mini mirror, ibuprofen and Vaseline. 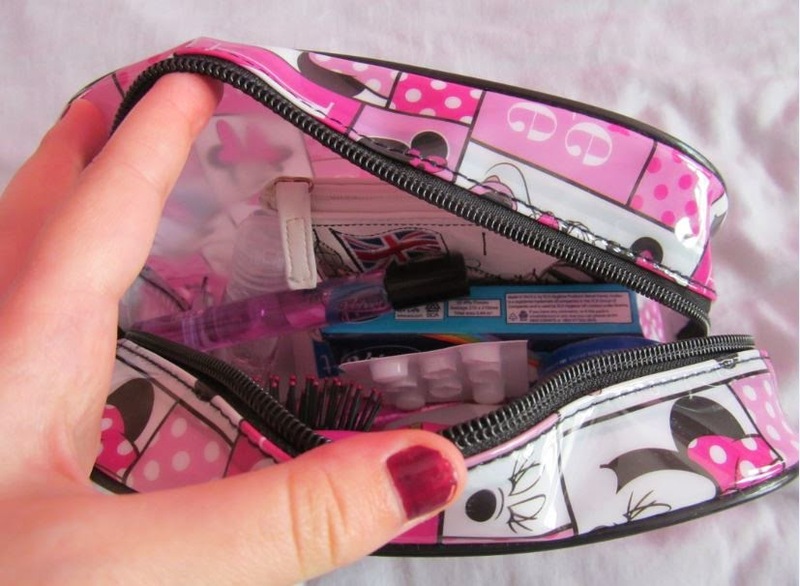 Inside this purse are spare hair bobbles, grips and headbands. 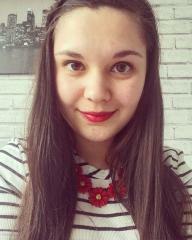 I rarely take make-up to the gym because I tend to go straight home afterwards! And of course I always make sure that I have a bottle of water with me at all times! It’s important to keep hydrated!